Make the journey from work to home simpler. Our dedicated fleet is customised to suit the requirements of individual mine sites. Our dedicated Mackay Transit mining and resources fleet makes travel between work and home safe, efficient, and comfortable. This service is exclusive to mine staff and stops over in in areas from Bucasia to Ooralea. Our experienced drivers and support staff ensure that your transport needs are met and exceeded in the utmost comfort. Mackay Transit Coaches has been operating School Services over many years and transports students to and from school safely each day. With trained professional drivers and a fleet of modern school buses you can be assured of our dedication to your children’s welfare and safety. 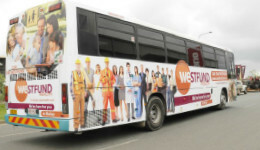 Mackay Transit Coaches provides weeklong quality public transport to the majority of Mackay and its surrounding regions. From city to country, our services can take you there in air-conditioned comfort. Mackay Transit Coaches makes commuting between work and home simpler with our unique mining transport services. Our Hail Creek Mine service is exclusive to mine staff and stops over in areas from Bucasia to Ooralea. Want to know about how to get there and what it costs? View our latest fare and timetable information. You can also plan your journey hassle-free with our Translink Journey Planner. Mackay Transit Coaches has been operating within the Mackay Region for over 25 years. We pride ourselves on being the premier transport company in the region. With a fleet of over 70 vehicles ranging from 11 to 61 seats, we are able to provide a vehicle suited to your custom requirements. Our coaches are optimised for comfort and safety. Our friendly and professional team of drivers are passionate about ensuring that you get to your destination as efficiently and safely as possible. We’ll look after you. Service is our speciality! We provide our customers with safe, efficient, quality transport solutions all day long and all year round. No matter when you need us, we’re there for you. What’s on? At Mackay Transit Coaches, we’re passionate about our local community, so we work hard to keep our customers up-to-date with the latest regional news and information. Click here to check out recent community updates. "Insert testimonial copy in this location Itis nissint quist eum voles es ilis arumquis conseque volum quo beat plant aspiendelia dolorest que maiorrorunt perum eum sent aliquate non ped et qui deles ni num eum." Book your next trip with our online booking service! Mackay Transit Coaches has been operating within the Mackay Region for over 25 years. We specialise in providing safe, quality, comfortable transport solutions and experiences to a range of public and private sectors. At Mackay Transit Coaches, our team is both proud and passionate about what we do. Have some feedback, good or bad? Please complete our short online feedback form.